Siargao is known as the “Surfing Capital of the Philippines” but this place is not limited only for the professional surfers or surfer wannabes. There is so much in this place than its massive waves that even I, a city girl who’s afraid of the water, loved and enjoyed it. 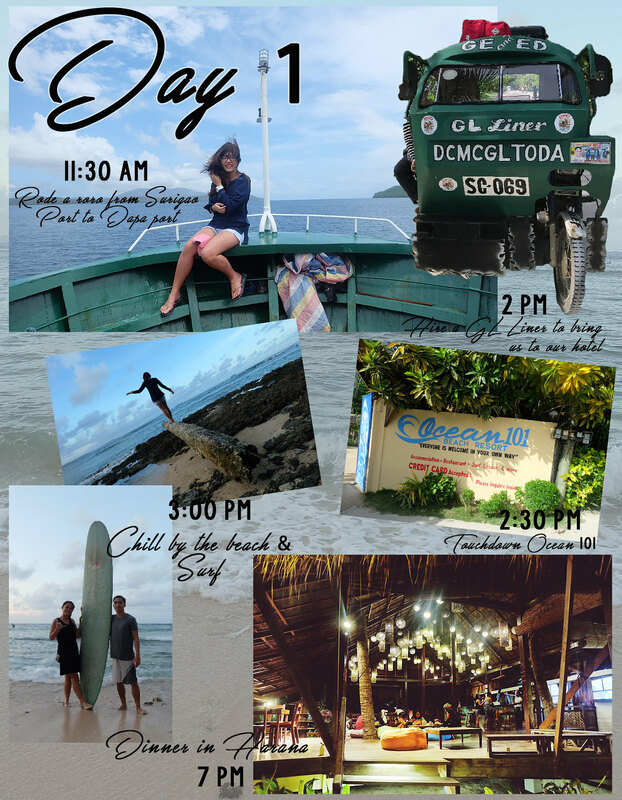 So, from the non-surfer me, let me share you my itinerary to this beautiful and chillest island in the Philippines. 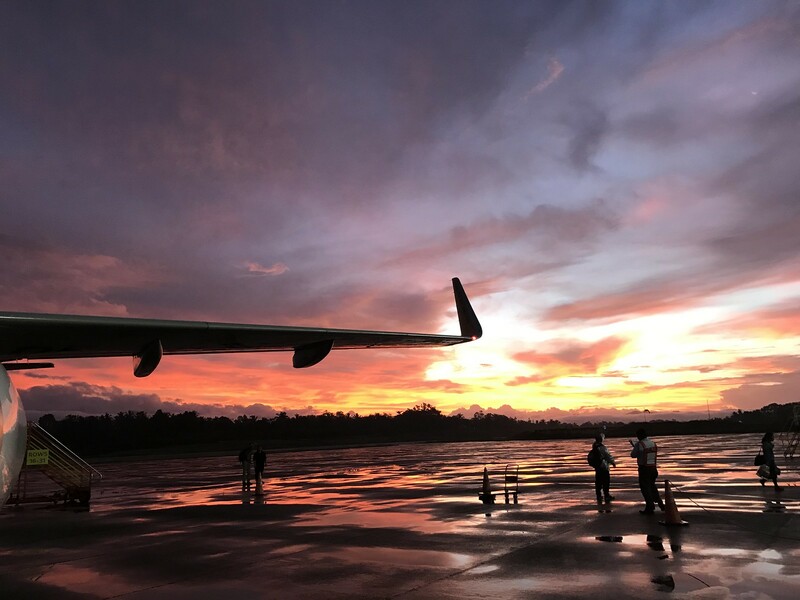 via Skyjet Airline: Skyjet offers direct flights to Sayak Airport. Plane ticket starts at P3,000 one way. Watch out for their seat sale. Airfare can go as low as P3k/RT. via Cebu Pacific: Cebu Pacific only have direct flights to Siargao from Cebu City so if you’re coming from Manila, you have to fly to Cebu first. You can also opt for a flight to Surigao City and Butuan City. UPDATE OCT 2017: Cebu Pacific already offers a direct flight from Manila to Siargao!! via Cokaliong Shipping Line: Cokaliong Shipping line offers motor vessels that travel overnight from Cebu to Surigao City for P825 starting price. Since Cebu flights are often on sale than Siargao ones, this is a cheaper way but time-consuming one. Ours is via Cebu Pacific Manila to Butuan. It is not on sale so we got our ticket around 6k pesos. Cebu Pacific’s Siargao flights are rarely on sale so I advised you to keep an eye on Butuan instead. You can get it as low as P600/RT. If you choose to fly to Surigao City: You still need to ride a roro from Surigao Port to Dapa port for 2.5 hours. (P250) The last roro to Dapa is at 12:30nn. If you choose to fly to Butuan City: Ride a van to Surigao City just outside the airport for 3 to 4 hours. (P200) We did this and the travel consumed almost a day. We arrived at Butuan at 6 AM and we reached Siargao at 2:30 PM. Wew! Siargao offers all kinds of accommodation, from budget to luxurious, for the solo travelers, to couples, to groups. There are also Airbnbs around but most of it are big beach houses and habal-habals might not be familiar with it since it’s residential. 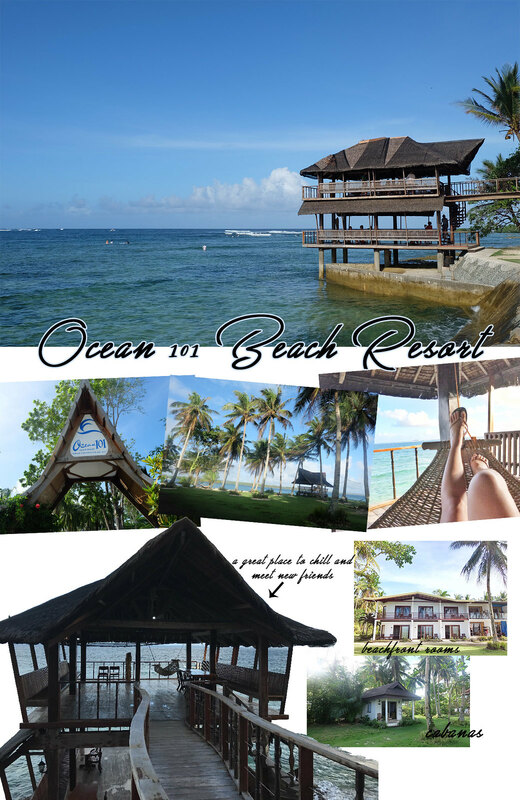 So we stick with the beach resorts and I was able to book Ocean 101 Beach Resort in Travelbook.PH. Ocean 101 is in between of budget and luxurious. We paid around P10,800 for a 3-night stay in a family room for 6 adults that can actually fit 10 persons. It is just 5 minutes walk to Cloud 9 Boardwalk and some famous cafes and restaurants in Siargao. If you want a good and beautiful place to stay but don’t want to hurt your wallet at the same time, I recommend you here. Please take note that most of the prices above are divided into 6 persons. Bigger groups tend to be cheaper so I advised you to bring your friends or make friends to other tourists to share the boat fees. Everyone is friendly on this island so don’t be shy to make friends at the restaurants and hostels. We met a lovely couple in our island hopping who even let us have a drone shot! So go ahead and be extra friendly. Hi! Watch out for the seat sale of Skyjet direct flights to Siargao. You can score a roundtrip ticket too for just 3k. So puede puntahan magpupunko pool and sugba lagoon in one day? I can just follow your day 3 itinerary.? Girl, yung sa surfboard rental walang instructor? As in sariling sikap ganun? Huhuhu. Anyway, ang ganda ng lahat ng islands and beaches ? You can hire instructor din for P500 pero sobrang unlike ng Baler na lahat gagawin nila for you. They’ll teach you how to paddle and everything so sobrang nakakapagod! I enjoyed the island hopping din. Yes, me too. I just went and I wanted to go back na. Ohdiba? I didn’t realize you have your own blog, Bea. Love your IG feed, btw. I didn’t know that Siargao is the Surfing Capital of the Philippines. I know that it’s famous for beaches, but I’ve never really been there. I only see photos from friends and none of them went surfing when they went there. Ha! Your itinerary is noted. But I might try to learn how to surf if I go there. I’ll have to learn how to swim first, though. Ha! BTW, I love how you crop and paste your photos like that. It makes it look like pages from a magazine. Hi, Heide!! Welcome to thy humble blog. I haven’t advertised it at much on IG din kasi. I’ll do next time. Oh, it is. The waves are gigantic and will definitely eat you alive. haha! I’m not a good swimmer too but yes it will be an advantage to know how to swim din. Good luck on that! Nung nakita ko to sa IG mo nanlaki talaga mata ko!! Gustong gusto ko makapunta dyan! huhu. Kaso laging wala akong mahanap na kasama. 🙁 Subukan ko hatakin si Joanna dyan hahaha. Yung sa Ocean 101, 1800 na yung total for 6 persons??? Ang mura kung ganun! Sana ako din makapunta dyan someday. Go na girl lalo na ngayong may Skyjet na! 🙂 Nope. P1,800 yung naging hatian namin. Mej pricey since late na kami nagbook din. Grabe! Siargao is always on my list of places to visit. Sana makabook ako ng ‘cheap’ flight! PS: Grabe yung pinagdaanan nyo just to go there! YEEESS! di talaga advisable ang Butuan except when you want to tour Surigao din. Ever since I experience LU, I have been wanting to visit Siargao! Thanks for this post 🙂 So detailed! GRABE! Yung Butuan to Siargao nga lang nahassle na ako. How much more if from CDO?!! But yes, the island is super worth. I wanted to go back nga since Skyjet offers direct flight na! yay!! Love the detailed the itinerary! My friends and I are going there on the 20th. If i may ask, the whole island hopping(naked/daku/guyam) just cost your group 1500? Appreciate it if you could share the contact # of the guide or with whom we can coordinate that tour. Thanks a lot! hi.. Are the boat ride waves going to Siargao island are really big and scary?, How about this summer season, waves are the same(“gigantic “). Is this true? What boat ride? If the Surigao-Siargao boat ride, it’s bearable naman since we rode a roro naman. I didn’t get seasick too. The waves can be really big that why the last roro to Siargao is at 12:30PM. The island hopping, sugba lagoon are not advised to be done on afternoon because of the waves too. hello. i checked ocean 101’s website and the rate for the family room is different from what you quoted. it’s $84/night on the website. is there another family room at a cheaper rate? planning to go there this Sept group of 6. Hi! DIY in siargao Aug 1-3? who’s up? Romantic Beach Villa as I remember has a pool so I guess that will be good for your son. The waves are really big in Siargao so I don’t think the ocean is safe for him kasi even I kinakaen ng alon. I suggest you do the island hopping. (Naked, Daku and Guyam) Magpupungko Pool Rock is beautiful too but it will take 45 – 60 minutes to reach it from General Luna. Hi! Did you visit Club Tara in Bucas Grande? Nope eh. Maulan kasi ng slight nung pagpunta namin so di kami nakadaan kahit for photo ops lang. hi! good day I had fun reading your SiARGAO experience. I and my boyfriend are planning to go in Siargao by October hopefully. I just want to ask if KUYA LOYDING is your only tour guide for 3 days? I mean, can he make all the land and boat arrangement for us so it’ll be a hassle free tour for us since we are just two person travelling? looking forward for your response. Yes, si Kuya Loydin lang lahat nag ayos for us. Kahit yung pagbili sa palengke for lunch pwede mo irequest sa kanya. He can make both land and boat arrangement since he has a trike and boat na rin. Say hi for me pag kinuha niyo siya. Great! What a relief! I’ll get back to you soon once we set the specific date for OUR Siargao experience. We will follow your itinerary for sure!! I’ll send your regards! Hi! Thanks for posting this.. swak to sa’min were going there on October ask lang.. last day nyo is Bucas Grande dala nyo na gamit to Socorro? and sa Hayanggabon kayo naligo? Hi Cath! Yes, dala namin. Yung bangka ni Kuya Loyding has storage para sa gamit then hinatid na niya rin kami to Hayanggabon Port after. Dun na rin kami naligo sa Hayanggabon for P20. 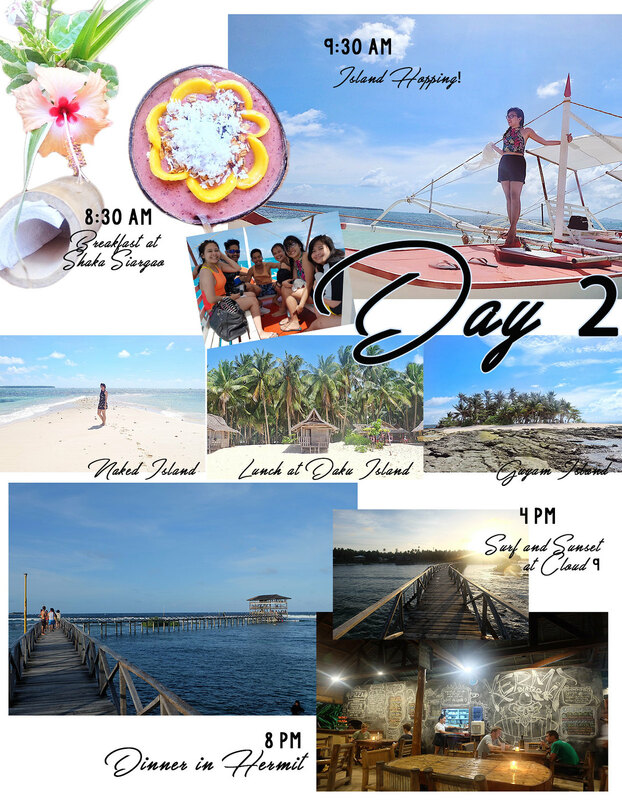 I’ve read blogs and itinerary for Siargao. And this one is the best so far. So detailed and may prices pa talaga. I’ll be going there with my family. We’re from Davao. May question ako sis. Pwede kaya naming itawid ang sasakyan from Surigao to Siargao? I heard it’s pricey daw. And sabi may rent-a-car? Do you have any knowledge about it? Thank you!! Wala akong experience sa rent-a-car dun pero while making an itinerary before naencounter ko to https://www.carrentalsiargao.com/. You can try and contact them. For us kasi group of friends, medyo pricey siya so we decided to rent a trike instead na lang. Ocean 101 Beach Resort Family room costs us P10,800 for 4D/3N. We are 6 in the group so yung P1800 is divided ng kabuuan. It’s kinda pricey for me pero given the beach resort, okay na rin. Hi Bea! 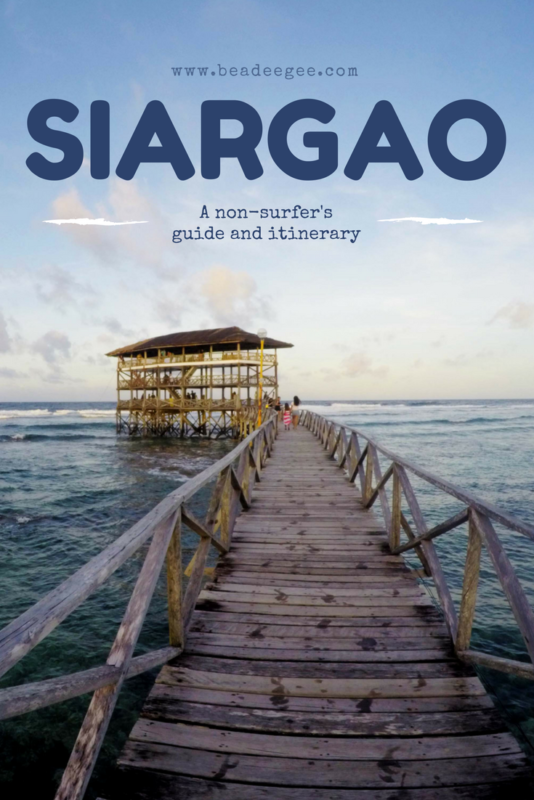 Great photos and post about Siargao. Very detailed and helpful. So glad that Skyjet now offers daily flights from Manila to Siargao with no hassle at all. Good thing we scored a ticket on sale just what you mentioned here at a great price. Really got too excited on our trip. Thank a lot! Hello, How did you do your arrangements for your Sohoton/Bucas Grande Tour? Hi, my partner and I will go in Siargao next year, June. Your blog is so helpful. Meron ba dun mga group tour na pwede kami mag join? Since we’re only 2pax. Hey yooo. Is there anyone here going to Siargao this Dec 10th to 15th??? You just got me super excited planning my trip to Siargao! !! Hi Ate! Since you rode the roro, how much po ba ang bayad pag dala ang sasakyan? Van po. Hi Jade, sa ocean 101 lang kami nagstay pero napasok ako sa Harana to eat parang mas bet ko yung Harana since malapit na rin siya sa cloud 9. Buddha kasi maganda din pero mas malayo siya. 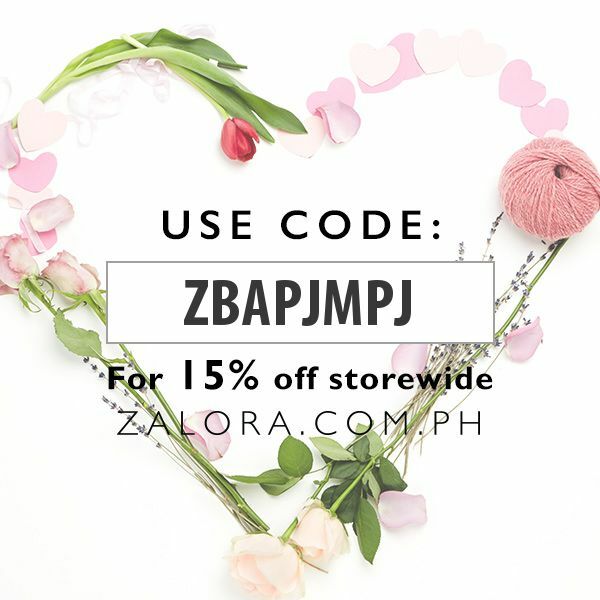 Hi Bea – Ganda ng blog mo! Very helpful! Just want to know kasama nba jan sa expenses nyo ung mga entrance fees ? Hi Poy, yes! Yung entrance fees sa island hopping, sugba lagoon & bucas grande naman is included na dun sa prices na inindicate ko. Hi Bea! Thanks for your very detailed itinerary. Which budget hostel or dorm yung mrecommend mo for 2 pax? And is it cheaper if mgbili kmi ng tour package at mgpbook dun mismo or mas mabuti yung advance booking? Will travel to Siargao on April 8-11. Hindi kasi sya weekend so I’m worried na walang mgooffer ng tours. Can you suggest a tour for the group of 20pax? What can you suggest in Day 1 (arrival afternoon around 2pm), Day 2, Day 3, Day 4 is free time. Hi Bea! your blog is so nice and informative. will be going to Siargao this coming March 29-30, back packers lang kami.. apat kami ng friends ko.. I’m just curios if okay lang kaya if magdala kami tent dun? I mean is it free or may bayad? and also san ba kayo sinundo ni kuya Loyding? wala kasi kami idea kung saan kami magsisimula ng tour eh. thanks 🙂 any way, nice idea yung collage ng pics mo po. God bless. And thank you. I’m not quite sure if pwede ka na lang bigla maglagay ng tent near the beach since most ng nasa gilid ng beach ay beach resorts na. Never saw a tent nung andun ako. 🙂 Sinundo kami ni Loyding mismo sa port since galing kaming Surigao. Text him in advance if gusto niyo siya sumundo. Thank you for appreciating the blog. MY IBANG NUMBER PA PO BA KAU KY KUYA LOYDING? Hi Bea! I love your itinerary. Our barkada is also planning a 4-day trip to Siargao this May. Would just like to ask if from Bucas Grande, you didn’t go back to Siargao anymore? Dinala niyo na ba lahat ng gamit papuntang Bucas Grande tapos dumeretso na agad for Butuan? Thanks. sis bea, do you think it’s possible to catch a ferry/boat from Surigao going to Sohoton ng 3pm onwards? 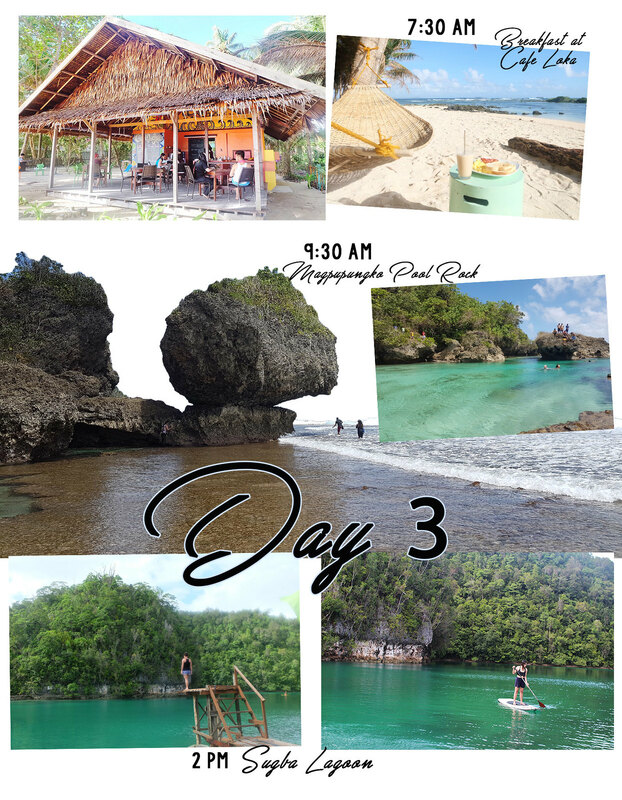 Plan kasi namin since we will be coming from Butuan airport ng 12nn pa, and obviously, di na kami abot sa Siargao Ferry sa DAPA, mag Sohoton nalang kami muna.. Then from Sohoton, mag island hop kami going to Siargao on the following day.. I hope I make sense. hahaha! May kausap na kasi kami tourguide sa Siargao. un Tour nia is 3islands(Naked, DAKU and un isa pa plus Sohoton, Bucas for 1500 each). I am asking him if pede daanan kami sa Sohoton then pag uwi, sa Siargao na kami diretso. Not sure if feasible un gusto kong manyari. hahahah! Thanks sis for the reply! Nakapunta na kasi kami sa Enchated and others kasi.. may nagbasa ako blog na 3pm meron pa daw ferry from Hayangabon Port to Socorro/Bucas. un lang baka din rin kami abot kasi 12nn pa un ETA namin sa butuan. hehe! 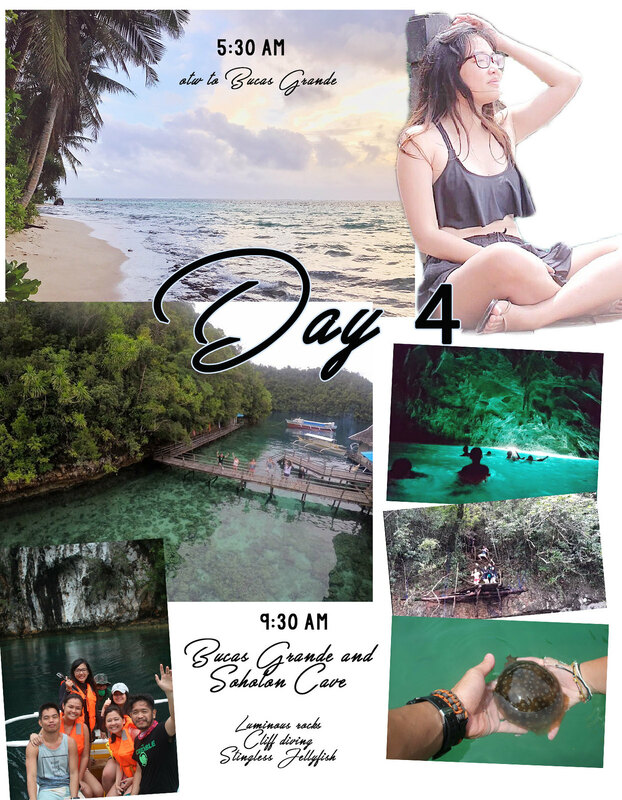 Orig plan ko kasi is mag overnight sa Club Tara or other resort dun, then morning saka kami mag island hopping going to Sohoton cove + 3 Siargao islands. Pede naman daw to sabi ni tourguide from Siargao. Un lang di nia ako sinasagot if makakaabot kami ng ferry sa Hayanggabon Port going to our resort. Kasi if di kami abot, sa Surigao nalang kami magpalipas ng gabi then mag ferry sa DAPA port nalang going to Siargao. Wish ko lang na sana mapaaga un flight namin same as yours para abot kami sa Siargao ferry para di kami nasayangan ng 1day. hehe! Thanks a lot for your blog! 🙂 Also ang ganda ng mga photos mo, effort un collage! haha! hi Bea. May I ask if kaya ba ang 3islands (daku, guyam, naked) at sohoton in 1day tour? Same boat po yung nagdala sa amin from Siargao to Bucas Grande and Bucas Grande to Hayanggabon Port. 🙂 Pero yung Bucas Grande tour po, iba po siya, solely for tours lang sa area. Hi bea! Ung tricycle ba from dapa port to accom is ung normal na tricycle sa manila or bigger type? Groupof 5 kasi kami and ung iba naming kasama is naka trolly bag, baka lang di kami magkasya. Hahaha.. Although may inooffer ung accom namin na van service which is 300 per head.. Thanks!! Hi! Did you go to Sohoton cave? Nag provide ba si Kuya Loyding ng pump boat? Hi Anne, yes we did! Nasa Day 4 namin. 🙂 And yep si Kuya Loyding din yung nirent naming boat.